Cyclist Lance Armstrong announces he will no longer fight drug charges from the US anti-doping agency, ahead of a Friday deadline. In a statement, Lance Armstrong, 40, maintains he is innocent, but says he is weary of the “nonsense” accusations. The US anti-doping agency (USADA) now says it will ban Lance Armstrong from cycling for life and strip him of his seven Tour de France titles. Lance Armstrong retired from professional sport in 2011. USADA alleges he used banned substances as far back as 1996, including the blood-booster EPO, steroid and blood transfusions. Lance Armstrong sued in federal court to block the charges but lost. “There comes a point in every man’s life when he has to say, <<Enough is enough>>. For me, that time is now,” Lance Armstrong said in the statement. “I have been dealing with claims that I cheated and had an unfair advantage in winning my seven Tours since 1999. “Over the past three years, I have been subjected to a two-year federal criminal investigation followed by Travis Tygart’s [USADA’s chief executive] unconstitutional witch hunt. 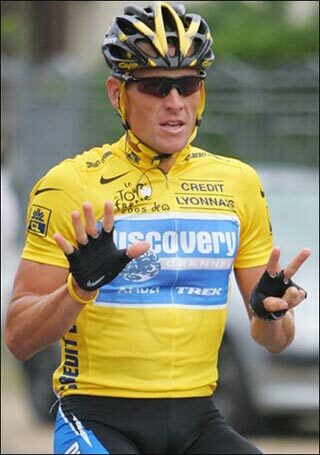 Lance Armstrong had been given until 06:00 GMT on Friday to decide whether to continue fighting the USADA charges. The agency has said that 10 of Lance Armstrong’s former teammates are prepared to testify against him. The cyclist has accused USADA of offering “corrupt inducements” to other riders. USADA also accuses Armstrong of being a “ring-leader” of systematic doping on his Tour de France winning teams. Travis Tygart said shortly after Armstrong’s statement that his agency would ban Lance Armstrong from cycling for life and strip him of his titles, according to AP. The chief executive described the case as a “heartbreaking” example of a win-at-all costs approach to sports. However, Lance Armstrong disputed that the USADA has the power to take away his titles. “USADA lacks jurisdiction even to bring these charges,” his statement said. The cycling governing body the International Cycling Union (UCI) – which had backed Armstrong’s challenge to challenge USADA’s authority – has so far made no public comments on the latest developments. Lance Armstrong, who survived testicular cancer prior to his record-breaking Tour wins, retired after the 2005 Tour de France but made a comeback in 2009. He retired for a second time in February 2011. Lance Armstrong now says he will be focusing on the work with his cancer charity.